Sensory Integration Therapy | Child Therapy Solution | East Midlands : Children's Therapy Solutions Ltd. In order for children to develop and learn, they need to gain an understanding of the world around them. If we cannot register, organise, filter, integrate and store sensory information then the world around us can have a great effect on our performance. Our Brain processes sensory information which tells us about our body and what we need to do. It helps us learn new skills and is a key element of child development. we always spill a drink because we just don’t grip the cup firm enough. Our Vestibular system is situated in our inner ear. 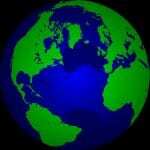 It enables us to sense linear and rotational movement with support from the visual system. When our vestibular system is feeling too much movement we may dislike car travel and dislike lying on our tummy. Sometimes our vestibular system needs more information and we seek movement and want to spin and twirl all the time. 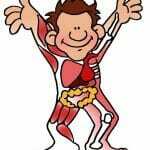 Interception is our ability to regulate our internal sensations such as respiration, heartbeat, hunger, thirst, bowel activity and sleep. 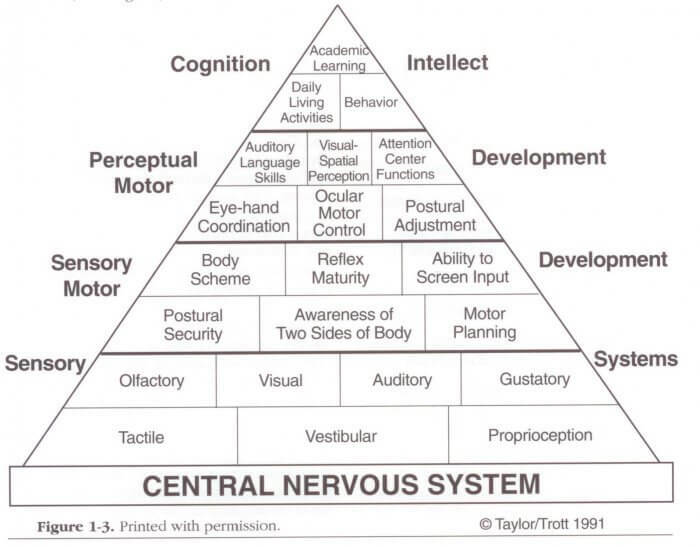 The Pyramid below explains how important it is for our senses to be working correctly. 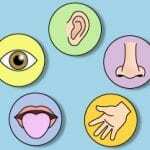 If we cannot process sensory information then we cannot grow and develop new skills. Sensory Integration Therapy incorporates the three primary senses in order to regulate our senses to begin to improve our sensory motor development, perceptual skills and academic learning. The thriving tree of sensory Integration will always be blooming when our senses are regulated. The roots are our primary senses, Tactile, proprioception and vestibular. If we feed our roots through sensory integration therapy, then we are able to regulate our other senses and grow and flourish as individuals, just like a tree when it is provided with the right amount of nutrients to grow. When senses are provided with the correct amount of information during sensory Integration sessions then we can often begin to engage in tasks that without sensory based intervention we would not have the ability to complete. If you would like any further information about Sensory Integration, do not hesitate to call the office 01664 567917 and we can arrange for you to chat with an Occupational therapist.